The weather certainly seems more wintry as we open Coco's door number 3 to see what she has in store today-and Day 3's post is perfect for wintry skin. I was kindly gifted some Luvenesco Hydrating Cream for review; so pour a cup of tea and relax as I tell you all about a great remedy for your skin's winter blues! Face creams; okay it's not strictly a fashion-related post, but it's important to look after what nature gave you! I'll admit, I'm a little late to the party when it comes to skincare. I started moisturising my skin every day earlier this year, particularly as I find that the amount of running I do outdoors really dries out my skin. I'm an advocate of the Body Shop usually, swearing by loads of their products (and their Vitamin E face cream in particular is my favourite for everyday) but when Luvenesco contacted me to try out their Hydrating cream, I was curious to see how it would differ from my go to choice. 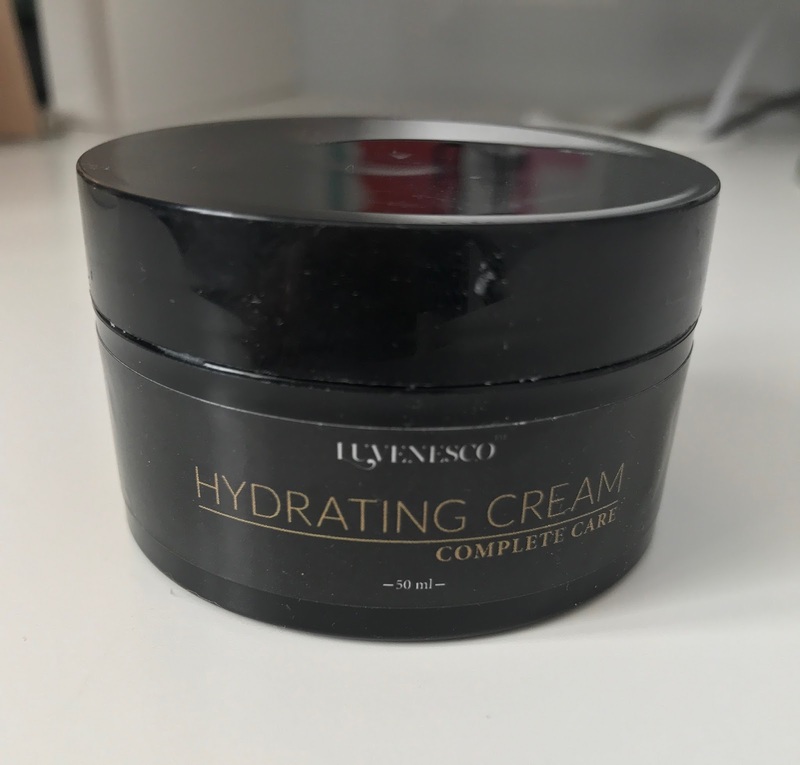 Boasting 'visibly younger looking skin for both men and women', 'active anti-age supplement for face' and 'powerful antioxidant properties', the hydrating cream sounded absolutely amazing and I have to say, I was really impressed with it. It contains aloe, which we all know does wonders for our skin and it smells fresh and citrusy, which pleased me as I'm not a fan of stinky moisturisers! I found when applying, I only needed to use a small amount; the cream is rich and goes a long way. My skin felt instantly soft after application and it certainly didn't make my skin sore or aggravate my sensitive skin. As far as the anti-aging properties are concerned, I don't feel as if I've been using the product long enough to comment yet, but my skin did feel fuller and healthier after a couple of uses. Luvenesco are a small, family ran business, who take great pride in their cream and I did feel like I was using a luxury product when I applied it, even if the packaging is quite simple. I'd definitely recommend it for anyone that's looking for a more natural face cream that isn't as pricey as some of the high-end creams out there. So if your hands are feeling a little broken, or the skin on your face is a little dry, why not give Luvenesco Hydrating Cream a whirl? It's definitely a good one! I was gifted a pot of Luvenesco Hydrating Cream for this review, however all opinions are my own; I really liked it and would definitely recommend it! Coco's advent Day 25: Merry Christmas everyone! Coco's advent Day 1: Of corset's Christmas!